Employers and business owners should always look for ways to develop safer environments for their employees. As a business owner, it is essential to have a level of access control over who can enter and exit your building in order to keep it secure from intruders. One of the trends among businesses - especially large corporations - is the issuing of company photo ID cards. Photo ID cards allow employers to manage their property's access points through access control and guarantee that only authorized people are in certain locations at designated times. ​In larger companies, it is difficult to differentiate strangers from employees because management simply cannot remember each employee's face. Implementing photo ID cards as a form of access control makes it easier to identify employees and guests from intruders. Many companies now have a policy that everybody must wear company photo ID whenever on company property. At companies where much of the work is done in the field, like a service company or a Utility, employees must also wear their photo ID cards when visiting clients’ locations. Photo control access is an excellent method for increasing security on-site. We encourage you to consider adding corporate ID cards to your business's access control system. Not only are these cards relatively inexpensive, they are also one of the most versatile tools in the industry when it comes to customization. At S-O-S Electronics, we are proud to offer a variety of options to help you protect your Milwaukee business and keep your employees feeling safe at work. 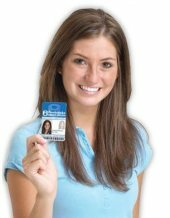 Contact us online or call (414) 616-7008 or (888) 214-1371 to order your photo ID cards in Milwaukee, WI today!